Imagine a Regency lady with a beautiful evening gown, like this one in grey silk with pink trimmings and grey gauze oversleeves. But — oh, dear — she’s ripped it, or perhaps something has been spilled on it. Who will repair the damage or clean off the stain? The lady herself? Unlikely. Much more likely to be an extra chore for the lady’s hard-working maid. We naturally assume that a gown as expensive as this one wouldn’t just be thrown on the scrap heap because of minor damage. And with so many hours of the seamstress’s time invested in it — as we can see from the luxuriously buttoned back, and the padded and beribboned hemline, shown below — it would be a terrible waste. But at some stage, this gown ceased to be worn. Eventually, it found its way into the Wade Collection at Berrington Hall. 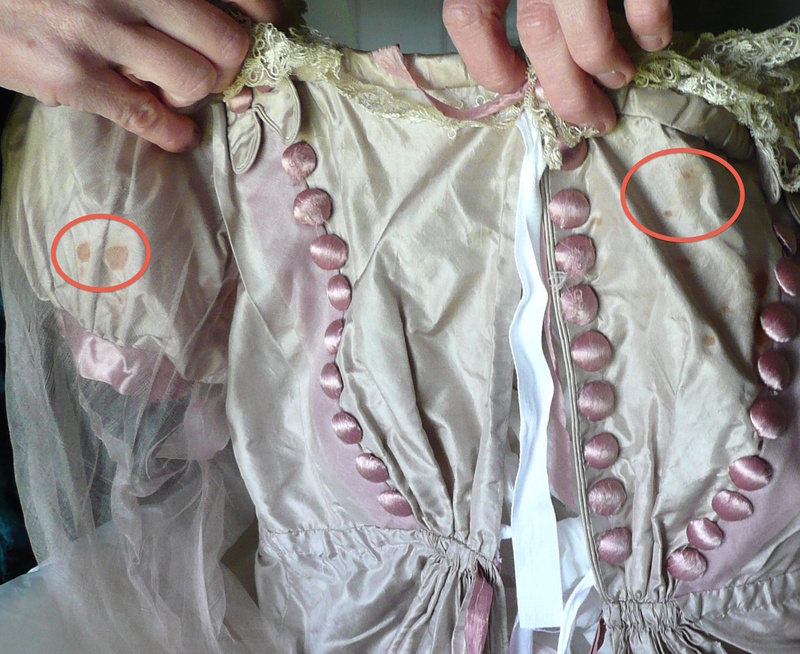 We don’t know how often this gown had been worn before the stains appeared — and they might be due to age — but they are clearly visible in the close-ups below, circled in red. If the marks had been grease spots, the remedy (according to Mrs Beaton) was pouring on two drops of rectified spirits of wine, covering with a linen cloth and pressing with a hot iron. That would have made the spot look “tarnished”. It could then be removed altogether by rubbing with a little sulphuric ether. Health and safety of the maid was clearly not a consideration. The general method of cleaning silk (again according to Mrs Beaton) was less dangerous: a mixture of a half-pint of gin, a half-pound of honey, a half-pound of soft soap, and a half-pint of water. The maid was to scrub the soiled side with the mixture, then to dip the silk in clean cold water and hang it up, without wringing. But it’s difficult to see how that could have worked with a complex gown like this one. 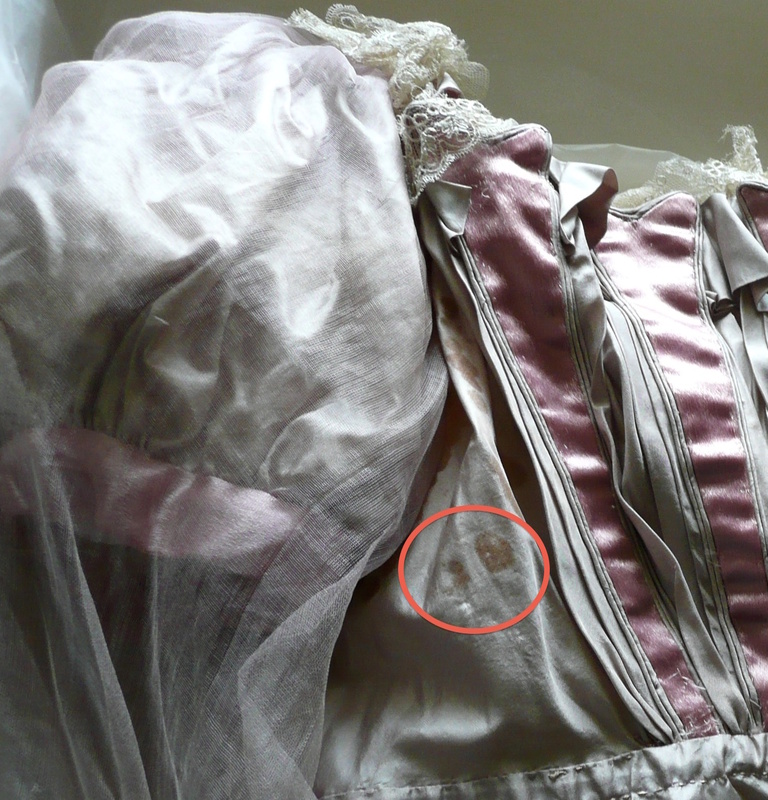 Maybe that’s why the gown is in the museum with its stains intact? A lady’s maid spent a great deal of time sewing. Much of that would be mending of one sort or another — rips and tears, missing buttons, and so on. The fine silks and gauzes of evening and ball gowns were very easy to damage. After all, an officer’s dress uniform usually included spurs — fatal if caught in fine fabrics. One clumsy misstep in the dance by any gentleman, military or civilian, could easily rip a hem. 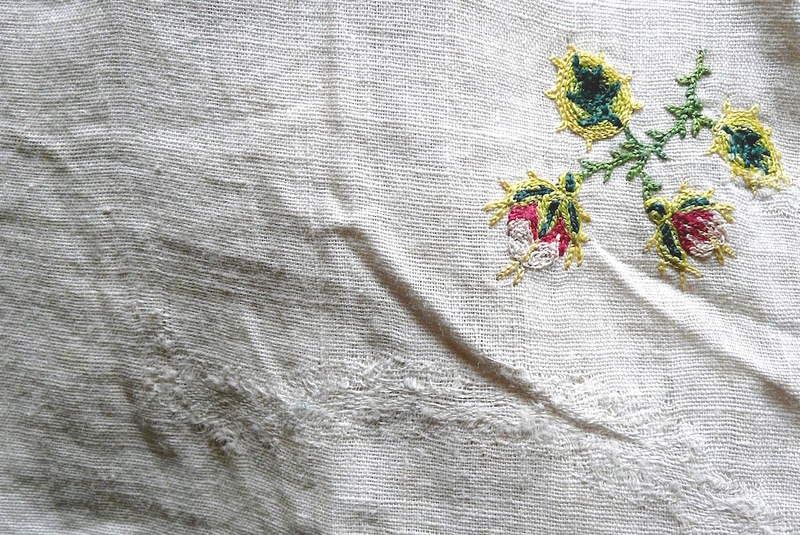 Perhaps that’s what happened to this embroidered muslin which has been neatly darned to be worn again. The small darn in the skirt of this plain green silk evening dress is almost invisible. 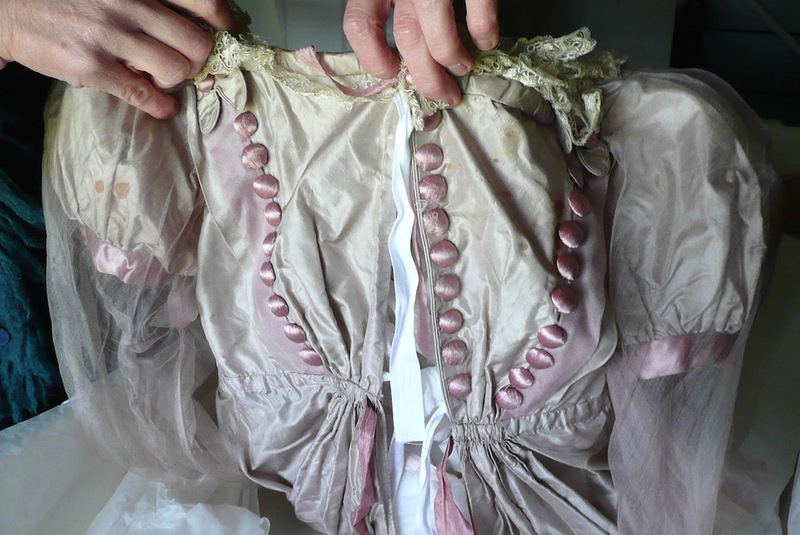 But the damage to this bodice was surely not made by an officer’s spur. 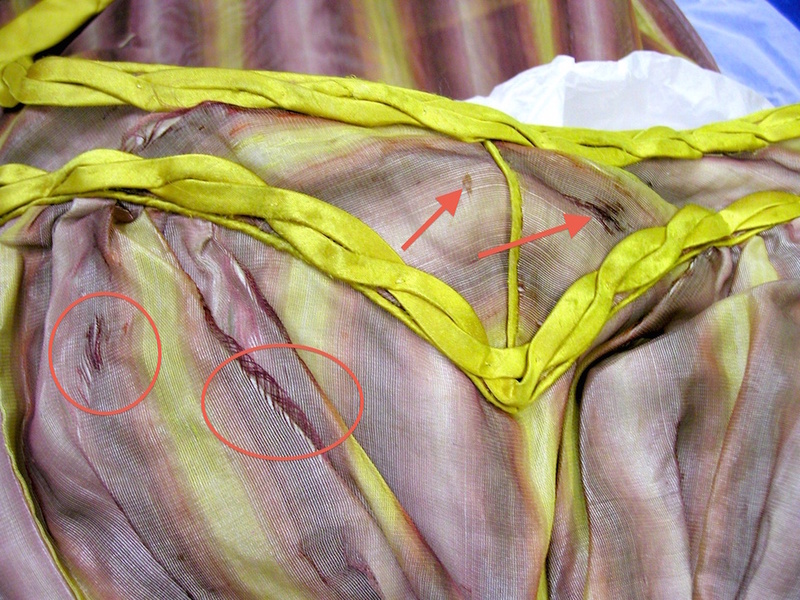 Stains inside the bodice, and damage to the breast region. Possibly by some rough handling? …could be converted into a rather more demure gown. 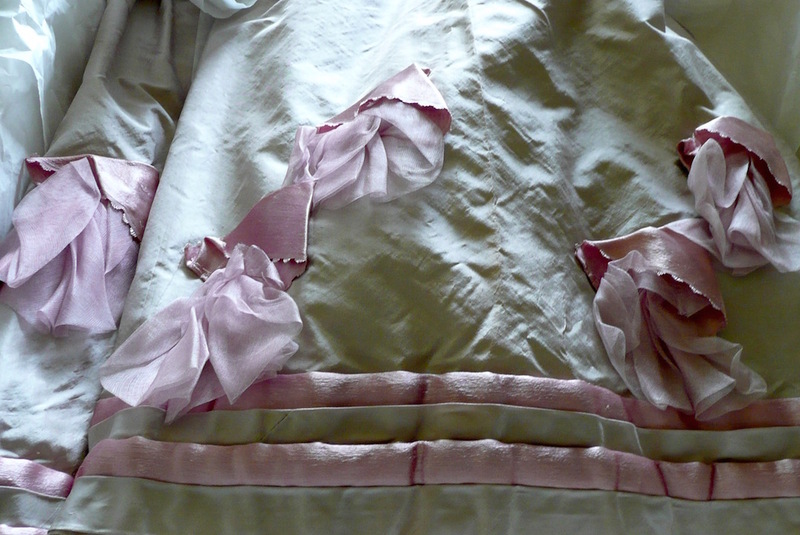 It could be made suitable for, say, a dinner party by the addition of long gauze sleeves of the same silk (shown here simply laid over the short sleeves). It would have been the maid’s task to ensure that the long sleeves fitted as though they had always been meant. And, of course, her stitching must not show. 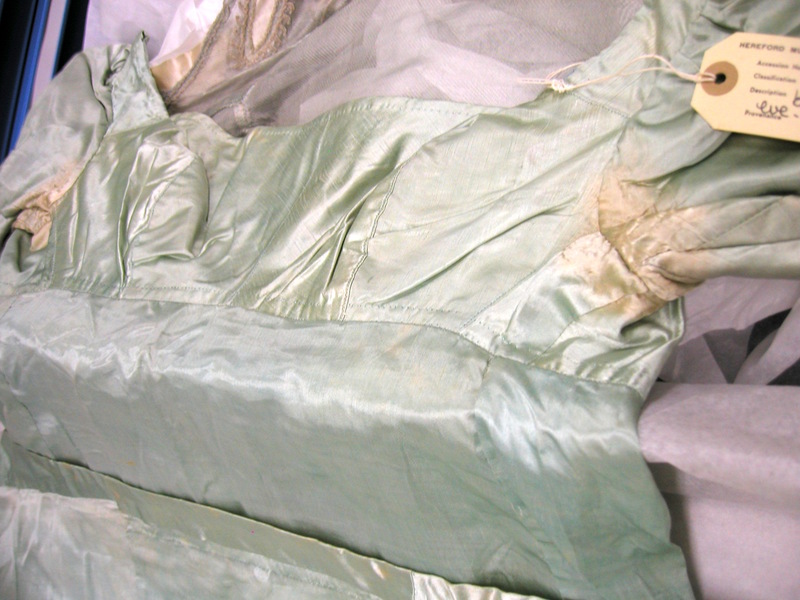 The plain green silk gown shown earlier was probably a favourite with its owner. Or perhaps she could not afford many gowns and so had to wear and rewear the few gowns she had. Not only had the green silk skirt been darned, but the damage in the underarm area is unmistakable. It is clear that the lady who wore it had done rather a lot of…er…glowing. Really enjoyed this, Joanna. It must the the week for costume. I’ve just put up a post on a mid-Victorian lady’s drawers! Loved this insight to the below stairs life of a Regency gown. Glad you enjoyed it, Liz. I had great fun poring over my pic collection and finding themes to pursue. Really enjoyed this, thank you. I remain grateful for the solidity of denim, cottons and a washing machine. I do so agree, Kitty. The hand washing of clothing (and underclothes too) must have been dreadful for the poor women who did it. Brummell may have lauded “good country washing” but it involved huge amounts of back-breaking work for those who produced his clean small clothes. It’s something we never think about with our heroine’s gowns. But you’ve inspired me. I think a sweat-stained and darned gown could well find its way into one of my upcoming stories. Nice idea, Liz. And why not? Silk does not wash easily so, if you’ve got only one decent gown, what do you do? Perhaps a shawl round your shoulders to conceal the stains? On the subject of washing, I was listening this morning to Dame Hilary Mantel’s Reith Lecture and she mentioned it, in relation to a much earlier period than the Regency. She pointed out that people were not dirty in earlier centuries. While it was true that the clothes they wore could only be shaken or brushed rather than washed, those outer garments never touched the skin. 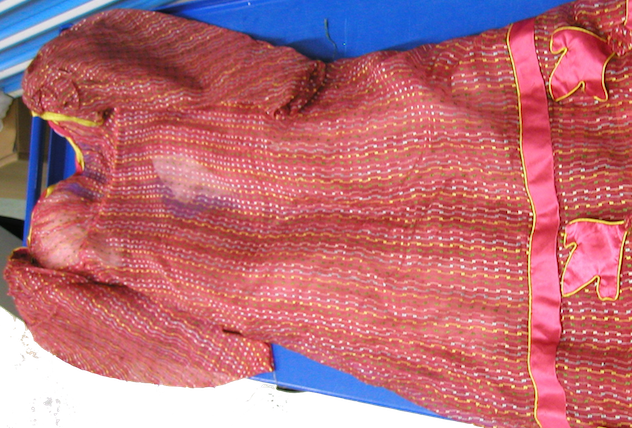 Next to the skin, people wore linen and their linens were regularly washed. 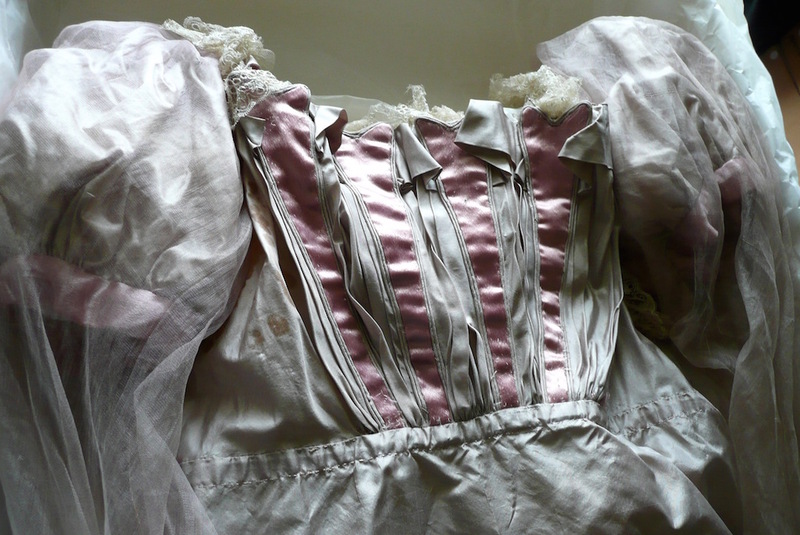 Lovely post, Joanna, brings the lives of those who wore the gowns back to life. Thank you! Thanks, Julie. I think our view of the Regency (and other historical periods) tends to be coloured by TV and films where our heroines, Lizzy Bennet & Co, are always clean and neatly turned out. No stains or tears or sweaty underarms for them. Given the difficulties of cleaning some garments, especially silks, I doubt it was as immaculate are movies suggest. I’ve personally had success with a number of stains on silk cushions in using a Renaissance suggestion, of soaking overnight in warm white wine or white wine vinegar then, if stubborn, a soak in salt water before gently washing out by hand. Fascinating, Sarah, and so useful, too. Will store that one away for future use. Thank you. Grease and candle wax mostly lift with an iron through a soft cloth [or kitchen paper nowadays] before treating it to a vinegar bath with a sprinkling of bicarbonate of soda and brushing gently with an old toothbrush. Sometimes you still have to add embroidery over the top though,depending on the grease. I haven’t found many stains that don’t lift to one or more of vinegar, lemon juice, bicarb and salt [and of course all women know the efficacy of soaking in salt water on bloodstains]. Red wine stains lift beautiful if soaked in white wine. My great great gran was a washerwoman. SO helpful, Sarah, thank you. And bears out the old adage: if you spill red wine on the carpet, dilute with white wine (though apparently soda water works too). Bicarb of soda, diluted in water, is also fantastic for getting rid of smells like (sorry) vomit from carpets and upholstery. It was a lifesaver when my kids were small. Very clear from your helpful comments, Sarah. Thanks again.